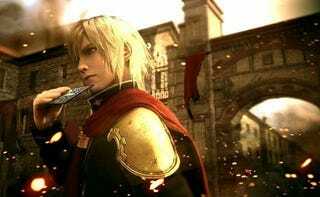 Earlier this week, just after press conference day, Square Enix dropped one of E3's biggest bombshells—that they're remaking the PSP game Final Fantasy Type-0 and bringing it to PlayStation 4 and Xbox One here in North America. This was exciting news for fans desperate to play one of the few Final Fantasy games that never made it out of Japan. All of those fan petitions had worked, and now Type-0 was coming here. Plus, as the PlayStation Blog reported on Tuesday morning, Type-0 would also be coming to Vita. Except... wait... just a few minutes later, Sony issued a correction. No Vita. Just consoles. Whoops. A whole bunch of fans were immediately pissed, and took to the comments of the PlayStation Blog to complain about Sony getting everyone's hopes up only to shoot them down a few minutes later. That Type-0 post on the PS Blog currently has 1,319 comments, almost all of them complaints about the game not coming to Vita. Exacerbating this drama were some tweets from Sony's Shahid Kamal Ahmad, who has spent months actively promoting the Twitter hashtag "#jrpgvita" and promising big Vita announcements for people who like Japanese role-playing games. Though Ahmad says Sony is still working on getting the game to Vita, a whole lot of fans are very pissed off about the whole situation. Square Enix designed Final Fantasy Type-0 as a portable game for the Vita's predecessor, the PSP, so many gamers expected to be able to play it on the go. And Sony's big screw-up poured a gallon of salt into that wound. Combine this Type-0 mess with a PlayStation press conference that was underwhelming for Sony's unappreciated handheld, and you've got yourself a whole lot of angry Vita fans. So now there's a petition, and even a popular new Twitter hashtag: #NOVITANOBUY.